Have you guys been seeing this 'kimono' trend? I have been seeing it around the last couple of years, but was unsure of the point. I try to be more functional than stylish these days, so I kept thinking "Is it like a cloak? But it doesn't keep you warm..? Is it mostly for tall people? Or moms? Is it supposed to be fancy?" ... and then I tried one on. All those question blew out the window and I got hooked. 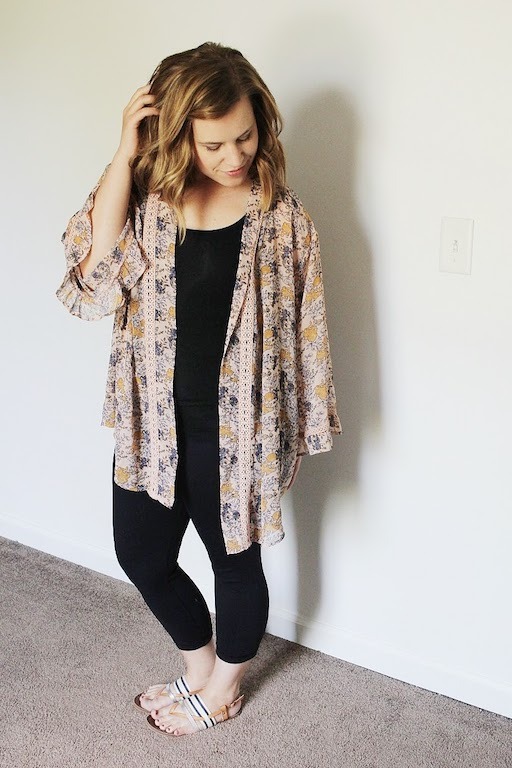 So this is my first kimono and three simple ways to wear it - trust me, it probably won't be my last one. On the topic of the functionality? I actually love it for summer. The summers here can be sweltering, and I love that the breathable material actually helps keep you cooler. The sun beating down on me doesn't feel nearly as hot, and somehow I've felt far less sweaty and gross when I'm donning it. It's also just really dang comfy while also feeling cute. I'd say kimonos are a win-win-win. Let me know what you think. There you have it! Super simple ways to mix up the same item. Of course, these could be adjusted by switching out different types of shoes, or adding jewelry, or trying different hairstyles, but I figured I'd focus on the basic adjustments you can make with staple items you probably already own! What do you think of the kimono trend? Would you give it a try, or are you waiting for it to pass?